To understand the economy today and to anticipate what will happen tomorrow, executives and investors should see the seemingly random movements of the marketplace within the context of history. 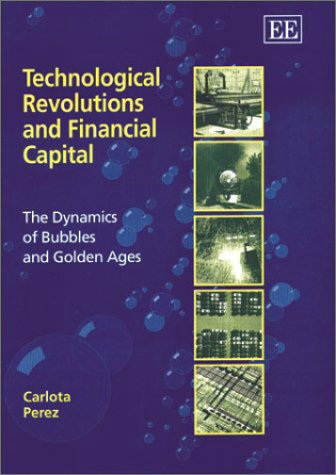 As world-renowned economic scholar Carlota Perez explains in her landmark book, Technological Revolutions and Financial Capital: The Dynamics of Bubbles and Golden Ages, breakthroughs in technologies and shifts in the way capital is allocated, as well as economic booms and busts, all follow a predictable pattern. Prof. Perez is a researcher, lecturer, and internationally respected consultant, specializing in the social and economic impact of technical change as well as the historically changing conditions for growth, development, and competitiveness. She is currently Professor of Technology and Development at the Technological University of Tallinn, in Estonia, as well as Visiting Scholar at the London School of Economics, Research Associate at the Judge Business School at Cambridge University, and Honorary Professor at SPRU, in the School of Business at the University of Sussex, all in the U.K. In this summary, we will explore the complex interaction between technology, the economy, institutions, and financial capital. In the process it will give you a new and valuable perspective on both the present downturn and the coming era of unprecedented prosperity.